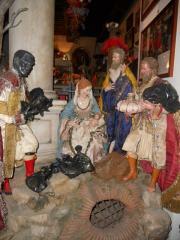 Christmas in Naples - Guess who's coming to the Manger? Some have commented that perhaps it's all a bit blasphemous, but the fabricators on via San Gregorio Armeno say in their defense that forcing this situation on the residents is altogether blasphemous. 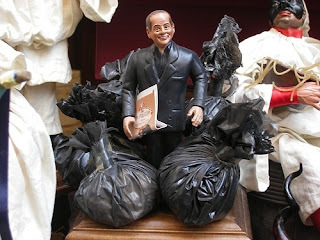 As for me, I like the ones depicting Berlusconi in any number of positions; not that I'd put him in my manger scene, however. Let's hope that as we celebrate Natale, it's a Rebirth or Renaissance for Bella Napoli. 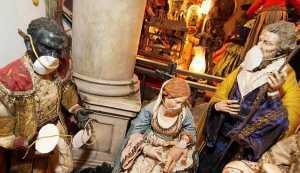 Certainly, the Manger scenes are the pride of that street in Naples. One of the places to see such scenes is in the Regia di Caserta. This magnificent Kings palace of 1500 rooms and fantastic gardens is matched by a display of 1500 figurines in their Manger display. Each figure is about 18 inches high. It's a place that few Italians visit and even fewer Americans. 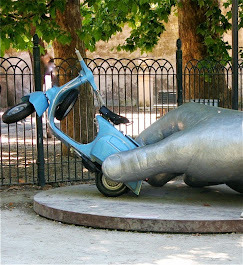 It all can be seen on one of my HD DVDs of my several trips to Europe.